Given the number of options on the market, selecting a CRM solution can be challenging for any business. 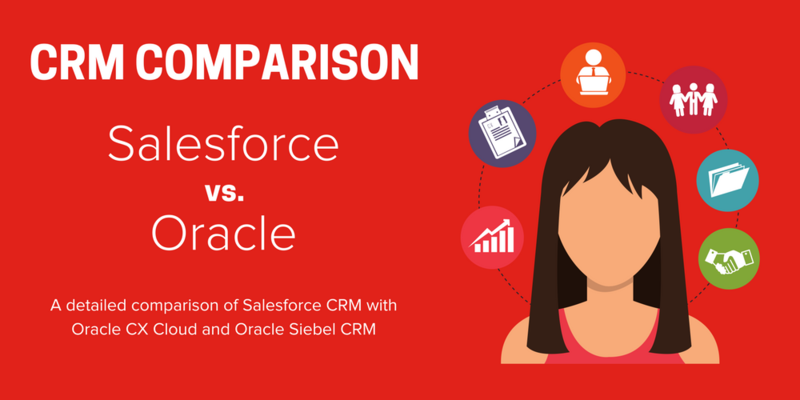 This Salesforce vs. Oracle CRM comparison helps you evaluate the fundamentals of each platform, and includes valuable insights provided by those who already use these relationship management systems. If you’re thinking about implementing a CRM in your business or are looking to migrate from your active product, it’s probably safe to assume that you feel you aren’t getting the most out of your current setup. Whether your sales are drying up, or your customer service leaves a lot to be desired, there are a number of ways that an effective CRM can improve a business. However, it’s essential that you choose the right platform for your organization. It isn’t the case of simply choosing the market leader or the product that has the most affordable pricing structure; you have to decide on a platform that complements and compensates for your strengths and weaknesses. Salesforce and Oracle are two of the most celebrated CRM platforms on the market but are very different in terms of functionality. To explore these differences, we must first become familiar with each platform individually; how the company came to be and which core values define the way they operate. While some CRM providers started out as a generalist software or business administration company, Salesforce has always centered itself around CRM. In 1999, Salesforce was released as a sales automation software, and quickly won plaudits for its ease of use and integration of different services. Being a Software as a Service (SaaS), Salesforce was attractive for the way it gave growing businesses a house in which to store all their data; a house that would continuously redecorate and refurbish itself to become more comfortable for its resident. It wasn’t long until Salesforce split its many services into different modules, allowing organizations to define what they needed from the platform and focus their expenditure accordingly. Oracle has been around for a lot longer, and the origins of the software corporation can be traced as far back as 1977, when longtime CEOs Ellison, Miner, and Oates founded Software Development Laboratories to develop a specialist database management system. By 1982, the company’s flagship product, Oracle Database (a multi-model database management system), was enjoying a generous portion of the market share — Oracle has never looked back since then. While they now offer competing products, the two companies come from different backgrounds — Salesforce has always been sales-driven, concerning itself primarily with CRM, while Oracle, is indisputably a data-driven service. With its many branches and product trails, Oracle’s CRM offering is just one of many products in its expansive and impressive arsenal — it was the second-largest software maker by revenue in 2015, though Salesforce wasn’t far behind. Indeed, without Oracle, there may not even be a Salesforce. Marc Benioff, the founder of Salesforce, was an employee at Oracle for 13 years before spreading his wings to form his own company. While he and Oracle founder Larry Ellison have clashed over the years since, Ellison was actually the first shareholder in Salesforce (contributing $2 million) and sat on the board of directors for several years before being asked to step down. Benioff may have once admitted that ‘Larry [Ellison] was very inspiring to me as an entrepreneur,’ and the two companies could be compared in terms of industry, growth, and lavish marketing efforts, but Benioff quickly moved away from the traditional software licensing model showcased by Oracle towards a subscription model. This move proved to be the defining moment for Salesforce, as they established themselves as a SaaS and, in turn, influenced the CRM industry forever. The rest is history. Salesforce takes a modular approach to its product selection, recognizing that businesses prefer a type of software more specialized to their industry or business model. Regardless of which product you opt for, the focus with Salesforce is always data and conversions. After all, what better measure of a CRM system is there than how it boosts your bottom line? Sales Cloud is arguably the crown jewel of the Salesforce CRM suite. For an organization looking to utilize business data to inform decision making, there is perhaps no platform more insightful than Salesforce Sales Cloud. Salesforce’s celebrated Einstein AI feature gathers a high volume of data with such a level of detail that businesses would often need to employ a data scientist for effective analysis. Thanks to Salesforce’s user-friendly interface, however, data analysis has never been more straightforward, which makes generating and utilizing sales leads effortless. Ben McCarthy is Managing Director at Salesforce consultancy EMPAUA, and is of the opinion that Sales Cloud is the cornerstone of the Salesforce business suite, but is best utilized as a platform to build your solution around. “A lot of customers invest in Sales Cloud as a first product because that’s what Salesforce is known for, its bread and butter,” Ben explains. “But there’s also Service, Marketing, e-commerce platforms and a lot of others. In the digital communications era when a high volume of interactions between business and customer happen in the public forum, customer service has never been more important. Brand reputations can be made and broken in an instant, and so processes must be established to both log and resolve customer queries, feedback, and complaints. With Salesforce Service Cloud, the emphasis is on case management, intelligent solutions, and self-service customer resolutions. Customers these days want immediate solutions to their problems; Salesforce provides the functionality for you to build workflows into your on-site feedback forms, giving customers a clear route towards a resolution, or at least a level of escalation that benefits their position. Not only does this make gathering information easier for you, but also offers a better customer experience. Interested in which Salesforce product serves the most customers? In our 2018 Salesforce Salary Survey, we found that 86% of respondents were using Sales Cloud, while 58% had embraced Service Cloud. To find out more about the use of Salesforce software in businesses around the world, download our latest salary survey. Salesforce Marketing Cloud aims to offer a comprehensive solution to modern advertising, whether this includes mass mailshots, social media posting, or even digital advertising campaigns. The emphasis is on mapping individual customer journeys from the initial brand interaction, through to the conversion, and then towards a repeat purchase. Personalized customer journeys ensure that the customer is approached in a way that appeals to them. Not all customers respond to social media campaigns, and some need to have an established relationship before they’ll even consider making a purchase. Salesforce’s marketing automation software enables businesses to record how potential customers interact with different facets of marketing, informing the best method of advertising to these individuals in the future. Einstein advanced analytics takes this task completely out of your hands. What’s more, Salesforce Marketing Cloud can be supplemented with several reputable products in their own right. Pardot is a must-have for those looking to visualize sales and marketing on a single cloud-based interface. Salesforce DMP is also a fantastic tool for gathering data from multiple platforms to jam-pack Marketing Cloud with intelligent customer insights. The presence of additional modules is one of the primary benefits of Salesforce; if you find that the bare bones of the service don’t satisfy your business needs, there are thousands of add-ons available on the Salesforce AppExchange to enhance your CRM product. While Salesforce’s core CRM offering is exclusively cloud-based, Oracle has multiple solutions that may be of use to your business, depending on your deployment needs. It makes sense that businesses implementing a CRM would choose a cloud-based system, as the functionality this allows in regards to accessing data remotely, integrating with web services, and product support makes the cloud an attractive prospect. However, this is not the case for all businesses, and those looking for an on-premise solution will be encouraged by the fact that Oracle’s traditional desktop CRM software is still one of the finest on the market. Oracle describes Siebel CRM as the world’s most complete CRM solution. It’s designed to encourage growth, help you provide exceptional customer service, and increase both sales leads and conversions. The platform actually originated from Oracle’s acquisition of Siebel, which was widely regarded as one of, if not the CRM market leader back in 2006. The meeting of two of the industry’s finest development teams led to the production of a best-in-class CRM product that continues to be embraced by businesses all over the world. Desktop integration with Microsoft applications. For retail outlets with hundreds or even thousands of products, Siebel’s commerce solution helps to manage and organize stock, as well as identify relevant cross-sell and up-sell opportunities. The platform also enables businesses to track the price of competitive products and adjust their own accordingly — when something changes, Commerce can work with Siebel’s Marketing application to quickly take advantage with an effective marketing campaign. Customer experiences not only determine whether a single purchase will turn into a repeat purchase, but can also inform how others approach your brand; a lousy customer experience tends to be the one that sticks with a service provider, especially in the age of social media. David Green is an expert in Oracle CRM systems, but admits that use cases for on-premise products are dwindling: “My starting position is ‘tell me why you can’t use a cloud solution’. There are legitimate reasons why some organizations can’t go cloud. 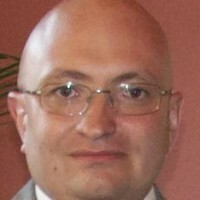 For example, companies in financial services may be apprehensive about using cloud to protect customer details. In a departure from the traditional CRM, Oracle also aims to provide a comprehensive customer experience platform where products are fully integrated into the cloud to make data analysis and lead management easier than ever. Oracle CX Cloud houses several different modules to take care of sales, customer service, marketing and social media management. Which of these modules you have access to, and the level of functionality you’re afforded, will all depend on your licensing level. Oracle Service Cloud aims to develop and nurture relationships with customers across all possible communication channels, whether through the web, social media, or a contact center. Case management is at the forefront of all actions within Service Cloud, with an emphasis on reaching the best possible resolution for both your business and the customer, in the least amount of time. In modern marketing, businesses must connect with customers over a multitude of platforms, taking care to explore which method is the most effective for those particular customers. Content must be relevant, timely, and personalized in order to be effective, and consideration should be given to turning a single-purchase customer into a repeat purchase customer — one sale alone is only half of the job! Oracle Social Cloud aims to make social media management a breeze through use of opportunity monitoring, timely engagements, and trend analysis. Analytics is everything in social media marketing, as it allows you to explore where your social posts are hitting and missing. Without finding out who is reading your brand messages on social media, how can you be sure you’re doing a good job? Additional products in the Oracle CX Cloud suite include Engagement Cloud, Loyalty Cloud, and CPQ (Configure, Price, Quote) Cloud. These modules center more around relationship management and customer retention, while CPQ resembles more of an ERP product than your traditional CRM offerings. Pricing can often be the deciding factor when it comes to choosing a CRM solution. Luckily, both Salesforce and Oracle offer levels of subscription, or at least a choice as to which products you subscribe to, to help businesses keep costs down. As well as giving businesses the choice of which products/modules they assume as part of their CRM system, Salesforce offers several tiers of subscription, which you can select depending on the level of functionality you need. Lightning Essentials — This is the bare bones, out-of-the-box solution that can facilitate up to five users per month. Small businesses with just a few team members would benefit from this. Lightning Professional — This tier of subscription offers more functionality, and is a viable plan for any size team, but may lack the customization to be truly tailored to the needs of a business. Lightning Enterprise — The Enterprise edition is the solution that most businesses opt for, as it includes all the features of Lightning Professional but with far greater capabilities when it comes to customizing your solution. Many organizations are looking for a CRM that is almost purpose-built, and Lightning Enterprise can be tailored to maximize efficiency; no added complications, no waste. Lightning Unlimited — As you may have gathered by the name, this package has no restrictions on its capability, and is the best that Salesforce has to offer. As well as being fully customizable, users are also afforded an unlimited amount of customer support and online storage. This makes migrating to the cloud far simpler for businesses, as there are no restrictions on your potential. The pricing for Marketing Cloud is a little more complicated. Salesforce prefers to provide bespoke pricing depending on the needs of the user. Within Salesforce Marketing Cloud, you have different focus routes to choose from — email marketing, social media marketing, advertising, and B2B marketing automation — so the cost of ownership depends on what you are looking to achieve from Marketing cloud. You may choose to subscribe to one of these focus routes, or create a comprehensive marketing suite by subscribing to several. The choice is yours! With Oracle Siebel being an on-premise CRM solution, businesses must pay an up-front perpetual license fee for each user. To benefit from the individual Oracle applications, you must first license Siebel CRM Base, which is the core product upon which all others are built. The license fee for Siebel CRM Base starts at $3,750, with industry-specific functionality also offered for a slightly greater expense. While other platforms have basic pricing for their given sales or marketing platforms, Oracle Siebel’s range of industry-focused applications makes product selection an important process at the beginning of the implementation. 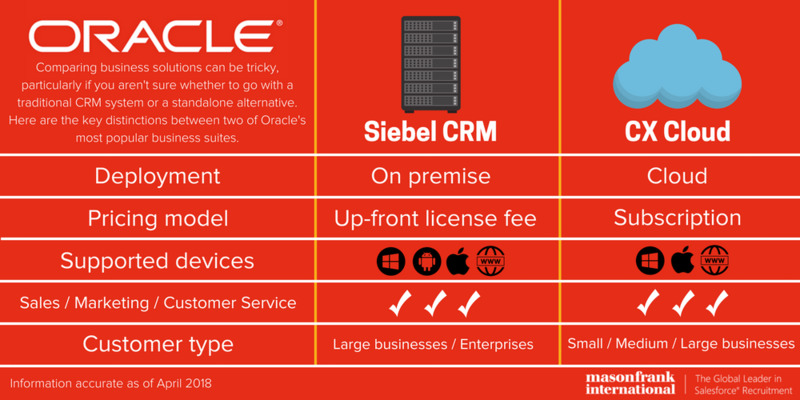 There are too many of these niche applications to list individual pricing, but take a look at the official Oracle Siebel CRM price list to get a better idea of how much your comprehensive CRM solution is set to cost. Oracle’s public pricing for its CRM products is somewhat cryptic, as the company prefers to recommend solutions to businesses directly and provide bespoke quotes. Much like Salesforce’s pricing policy on Marketing Cloud, Oracle does not share pricing for the majority of its CRM apps. The CX Cloud suite comprises of individual products, and Oracle prefers to issue quotes to businesses based on which modules they need and how many users require access. Capgemini is an award-winning technology consultancy with vast experience in both Salesforce and Oracle. To gain practical insight into the differences between these CRM solutions, we spoke to two of Capgemini’s leading product experts, David and Andrew, who specialize in Oracle and Salesforce respectively. Do you find that the subscription pricing model of Salesforce is a lot less daunting for businesses looking to implement, as opposed to a licensing fee? What is CX Cloud for Midsize? If you find that the many products in the Oracle CX Cloud suite are out of your price range, or boast a greater level of scope and functionality than you require, other options may be more suitable. CX Cloud for Midsize aims to assist midsize organizations with the same services that are available in the full CX Cloud suite, but with only the core functionalities retained to ensure businesses are only paying for the features they need. Customers can still pick and choose which services they are looking to benefit from, but these are far more streamlined and therefore available at a far lower cost. This model won’t be suitable for all businesses, however, and so it is recommended that prospective users contact Oracle to get a bespoke quote. A product expert will be able to propose a plan that makes financial sense for the business, whether that’s a single module, CX Cloud for Midsize, or the total package. With both Salesforce and Oracle being two of the most popular CRM solutions on the market, it would be careless and disingenuous to state outright that one is better than the other. It really depends on what is most important to you and which holes in your business processes you are looking to plug with your new CRM. Salesforce is incredibly malleable and can be customized to serve your business at maximum efficiency. The Salesforce AppExchange continues to grow in size and strength. The number of third-party applications available to enhance the raw Salesforce platform makes this CRM platform the gift that keeps on giving. Salesforce has nurtured a very user-focused community, to the extent that the company, or one of its many accredited implementation partners, can provide strategic advice before, during, and after a product implementation. Salesforce’s new Einstein AI module aids with both identifying trends and identifying new leads, doing the work that would previously require a data analyst. For medium-to-large businesses, Salesforce could prove to be a costly solution. These organizations would require at least the functionality offered by Lightning Enterprise, which works out at $150/user/month. Many businesses could find themselves priced out. A common criticism of Salesforce is that it is reliant on third-party integrations to enhance its bare-bones CRM system. Often users will have to pay extra for additional applications to get the system running to their satisfaction. However, these niche applications are usually the best of their kind, so you tend to get what you pay for. Implementation can often be a lengthy process, particularly if you are looking for a purpose-built solution. It’s recommended that you research similar implementations in your industry, which could effectively be replicated for a cheaper and quicker deployment. This CRM system is a brilliant solution for enterprise-size businesses and beyond. It is sufficiently robust to manage and harness data from thousands of sources across a large-scale organization, aided in part by its on-premise deployment. Oracle Siebel CRM provides a set of best practices housed in the product. These span a range of industries and feature insight that could immediately boost the bottom line of a business. Free 24/7 customer support, included with the license fee. 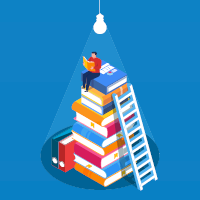 Oracle Siebel’s support has always been looked upon favorably by its community, and this is complemented by the free training webinars available to customers. The platform has been criticised for the irregularity of updates, with many suspecting that Oracle is subtly bringing this product to the end of its life cycle in an effort to focus on cloud CRM. This would be consistent with other CRM providers. Pricing is often a stumbling block, which is why you only tend to find large companies using this CRM solution. With this platform being solely an on-premise solution, it doesn’t have the functionality in regards to remote access and mobile CRM that its competitors do. Despite the integration with Windows desktop technology, Oracle Siebel is not compatible with Windows mobile. While the product is constantly updated, Oracle CX Cloud has been around for a long time now, so there is no naivety in the platform’s code or the support team. All the usual bugs and stumbling blocks have long been identified and eradicated. The Oracle CX Cloud suite aims to provide users with seamlessly integrated solutions that service the entire customer journey. This means never leaving one product and opening another — everything is available to you in one comprehensive platform. If a user opts for solely Oracle Marketing Cloud, this can be integrated with another CRM, such as Salesforce or Microsoft Dynamics. This flexibility makes the individual cloud modules great utility products. While Oracle products boast integration with third-party CRMs, this functionality has been criticised when trying to link with one of the smaller CRMs. You won’t have any problems with the market leaders, but cheaper, smaller-scale CRMs may not match up well with Oracle. Oracle’s user interface isn’t as streamlined or as aesthetically pleasing as its competitors, including Salesforce. Oracle is not considered to be a frontrunner in mobile CRM, which may be problematic for businesses that wish to access sales data remotely. 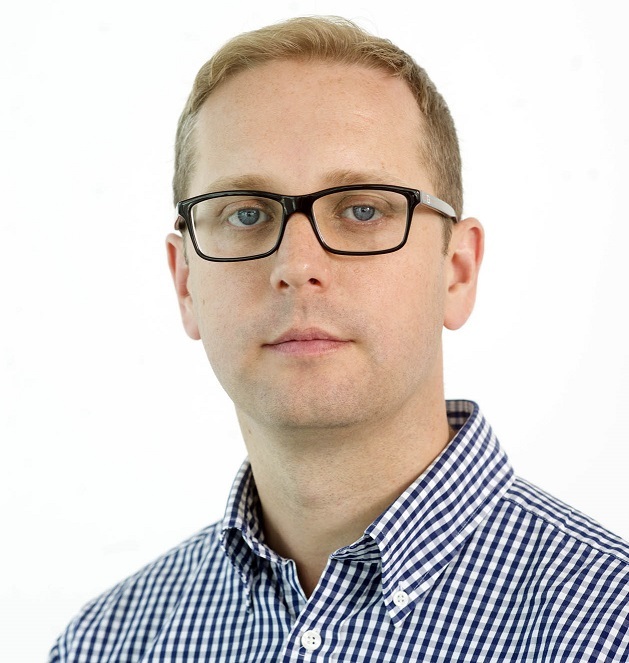 Salesforce is often praised for the sheer volume of independent solutions on the AppExchange, and this is something that Andrew Smith, UK lead for Salesforce at Capgemini, thinks sets the platform apart from its competitors: “One of the differences between the Oracle and Salesforce stack is the depth of the Marketplace and the AppExchange. Now that we’ve taken time to explore the features of each platform and given you a rough estimate of how much it costs to license or subscribe to these CRM systems, it now makes sense to look at what the users of each technology are saying about their experience with the software. We could talk forever about how a particular feature will ‘boost your bottom line’ or the likes, but how does the platform feel to use? Do staff enjoy navigating the user interface? How often does the system go down? These are all relevant questions to you as a potential consumer, and looking at user reviews is a great way to address your concerns. 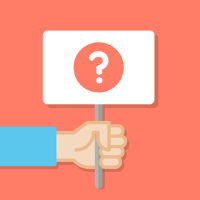 Unsure what to look for when choosing a CRM? It’s crucial to do your research when comparing CRM vendors, but it can be difficult to know what to look for. 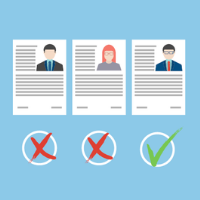 Read our detailed guide and download our CRM vendor selection checklist. We hope you have found this Salesforce vs. Oracle comparison guide helpful. While we’ve included all the essential information on these popular business solutions, choosing a CRM product is a huge decision and should not be taken likely. 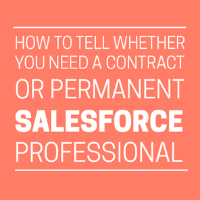 If you are torn between Salesforce and Oracle, it’s recommended that you speak to the vendor directly to discuss your specific needs; the infrastructure at these companies is fantastic, and their respective pre-sales teams can guide you through the full product specs without you having to commit to either solution. If you require a solution that can be customized to meet your every specification, you may be better off looking at Salesforce. 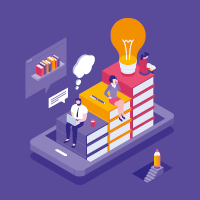 The platform is often praised for how functional it is and the extent to which it can be customized to appease the user, whereas Oracle is criticised for being the opposite. On the other hand, while Oracle may lack that flexibility when it comes to customization, this is arguably because the out-of-the-box solutions are strong enough to service your business without too much tinkering. User reviews suggest that Salesforce is a little reliant on costly third-party integrations, so while Oracle may cost more initially, you may find you get more bang for your buck in terms of base functionality. We hope this product comparison has provided enough insight to help you make a decision. If you’re interested in learning more about Salesforce and the way that CRM systems can transform your business, subscribe to the Mason Frank blog today for the latest insights into business optimization.